With a game at Park Hall in the evening (7.35 p.m. kick-off), Saturday afternoon was a perfect opportunity to visit a new Welsh ground. The question was, which one? I wanted somewhere quite close as I needed to be at The New Saints with plenty of time to spare as it was an Irn-Bru Cup game, so plenty to do. With Llangollen Town at home to Cefn Mawr Rangers in the Welsh National League (Wrexham Area) Division One, it ticked all the boxes and so off I went to Tower Fields for my 42nd Welsh ground. 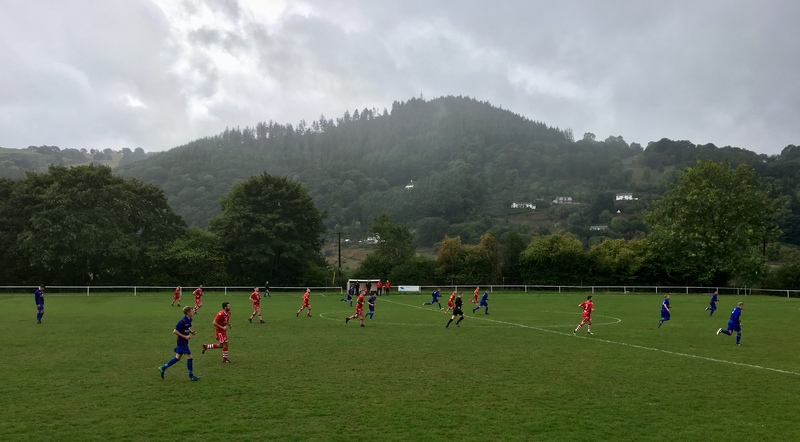 The word that comes to mind when I think of settings for games in Welsh football is ‘picturesque’ and I certainly wasn’t disappointed this time round either. I enjoyed the game very much, mind you I get something from every one that I go to. Whether working or pleasure, it’s all football and it’s all good. The final score was a very convincing victory for the home side. The turning point was a red card for the Cefn keeper. The resultant penalty gave Llangollen the advantage and they never looked back. I’m working my way through the Welsh National League grounds slowly but surely. I won’t be able to do too many until next spring when the midweek games begin again. When TNS FC fixtures allow though, I’ll be looking to make the most of every opportunity.